The petroleum geologist and engineer must have a working knowledge of petrophysics in order to find oil reservoirs, devise the best plan for getting it out of the ground, then start drilling. This book offers the engineer and geologist a manual to accomplish these goals, providing much-needed calculations and formulas on fluid flow, rock properties, and many other topics that are encountered every day. New updated material covers topics that have emerged in the petrochemical industry since 1997. 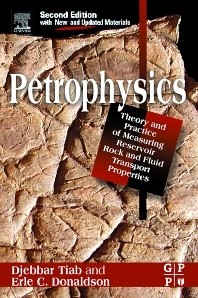 Students and Professionals in petroleum engineering and geosciences departments, reservoir engineers, petroleum geologists. Djebbar Tiab is the Senior Professor of Petroleum Engineering at the University of Oklahoma, and Petroleum Engineering consultant. He received his B.Sc. (May 1974) and M.Sc. (May 1975) degrees from the New Mexico Institute of Mining and Technology, and his Ph.D. degree (July 1976) from the University of Oklahoma-all in petroleum engineering. He is the Director of the University of Oklahoma Graduate Program in Petroleum Engineering in Algeria. At the University of Oklahoma, he taught fifteen different petroleum and general engineering courses including: well test analysis, petrophysics, oil reservoir engineering, natural gas engineering, and properties of reservoir fluids. Dr. Tiab has consulted for a number of oil companies and offered training programs in petroleum engineering in the USA and overseas. He worked for over two years in the oilfields of Algeria for Alcore, S.A., an association of Sonatrach and Core Laboratories. He has also worked and consulted for Core Laboratories and Western Atlas in Houston, Texas, for four years as a Senior Reservoir Engineer Advisor.